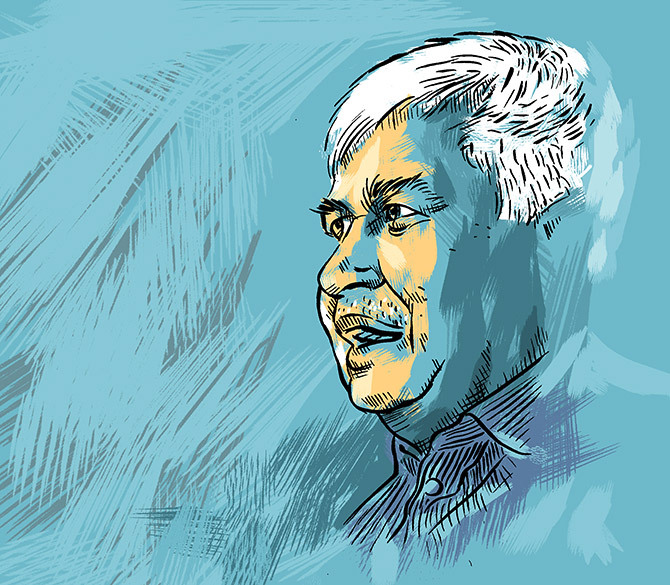 Trai could not have stopped Reliance even if the Jio offers had been the same, Trai chief Ram Sewak Sharma tells Subhomoy Bhattacharjee. I suddenly learn how many restaurants in Delhi's top-flight hotels open for business before 1 pm. The answer is, none! Ram Sewak Sharma, chairman of the Telecom Regulatory Authority of India (Trai), had said he would like to be over with our lunch by 1.30 pm, so could we meet at 12.30 pm? In the event it is rather funny, knocking at the doors of the Belvedere at Le Meridien, just past noon. I am sure no one has ever been that desperate to get an entry there so early. So, as soon as the staff gets over their bewilderment and unbolt the door for me, they rush across with a menu card for someone obviously hungry but willing to splurge. The comedy at my expense, fortunately, does not last long as Sharma walks in soon. He had suggested sharing his office lunch with me, but then I would have lost the chance to interrogate him alone. As I debate which of the controversies in the telecom sector to broach with him first, breaching all lunch/dinner etiquette, Sharma settles down with a glass of lime juice comfortably. "Never been here before," he says, surveying the skyline from the 18th floor. I ask him if the flak he received on the RJio promotional plan was also new for him. "Arre nahi, one is used to such comments," he replies. But he says Trai was caught by surprise when Mukesh Ambani's company kept extending the plan, three months at a time. It began in the middle of last year, when RJio said it was testing its soon-to-be-launched telecom service but signed on hundreds of thousands of customers. Soon thereafter in September, the company launched a promotional plan up to December and extended it in January for another quarter and sought to do so again in April. My guest is clearly in a mood to expand on the details, so we quickly order vegetable spring rolls as starters and, to the huge disappointment of the maitre d' hotel, stick to a vegetarian main course. Why choose the Belvedere for such a sparse meal, and so early at that? Sharma continues: "We looked into our rules and those were completely silent on how many customers a company could take on in the test phase." He says the telecom regulator has the powers to frame rules and also decide on them, but there is no denying RJio had committed no wrong if one were to go by the book. "Once the promotional phase was extended, we revisited our rules and were shocked to find that they do not forbid more than one offer, they only limit them to 90 days. Never mind the fact that it did offend my sense of what's proper." This was a challenge as there was no law to prohibit RJio. Sharma is clearly enjoying the rolls. "We referred the case to the attorney general. I told Mukul Rohatgi, mujhe aap ka honest opinion chahiye (I need your frank opinion)." He too said those were different offers. Trai, according to him, could not have stopped them even if they had been the same. Sharma says they were able to stop the company in its tracks when RJio launched its offer for a third time, as it had bundled a tariff plan with it. "It took the offer beyond just a promotional one and we blocked it." But why did RJio have to make the announcement, I ask. Shouldn't Trai have said so? Trai, he says, had told the company to desist in its communication, it didn't need to become a press release, subsequently. The regulator has learnt the lesson well and is correcting itself, he adds. "We are determining the basic principles of setting tariffs; in fact, I spent this morning with my people on it," he says. "The accusations against me did not take account of this problem. How is a regulator supposed to intervene when it has no powers to do so?" As he puts away the plate, he looks out of the window. "I can make an error of judgement, you will give me that space. But I have certainly shown no bias towards anyone." "The criticism which came my way in this episode was sometimes made without understanding these nuances." Would the episode leave an impact on companies when we are undertaking such a massive digital expansion, riding on their performance? From under his schoolboy hair-cut, Sharma looks at me. "I wouldn't think this upheaval would mess with that. They are mature enough to come to an equilibrium, which may not be often best for the customers," he adds cryptically. It is time to move to stir-fry vegetables with black pepper sauce. One must say it tastes well, despite my prejudice against vegetables in Chinese dishes. Sharma warms to the topic which is close to his heart -- Bharat Net. "See, I have lots of experience with implementing projects (he was director general of the Aadhaar project under Nandan Nilekani and subsequently chief secretary, Jharkhand). So I have an intuitive sense of which projects would work." He says Bharat Net has to be a public-private partnership to take broadband effectively to all villages in the country. "Bhai, broadband reach karna zaroori hai ki humein pahuchna hain (it's important that broadband connection reaches out, not the reach of the government). It hardly matters who takes it there." He says the insistence on making MTNL or BSNL solely responsible for last-mile connectivity keeps the fibre locked up in safe rooms of panchayat samitis (district-level units). "Are you going to appoint thousands of people to ensure the connections light up from there, or will you bid it out to the guy who will earn an income from the business to do it?" He says unless this is done we can never reach data connectivity in the villages. Incidentally, Sharma says he had made the same pitch as secretary, department of information technology, to the then communications minister, Ravi Shankar Prasad, and, as Trai chief, is making the same point to Manoj Sinha. "These are strategic issues on which we should spend time; it makes me sad that we are not doing so." The food, though good, is unwholesome, and Sharma has a good North Indian sweet tooth. “Bhai, do you have kulfi?" he asks the waiter clearing the table. I suggest date pancakes served with vanilla ice cream as a substitute. He agrees with my suggestion. Sharma explains Bharat Net and urban hotspots are the last point of connectivity and they need to be pushed at a frenetic pace. We have just 36,000 such spots, but we need more than a million, he argues. The insistence created the space for one more of the arguments that has punctuated his term at Trai. Earlier this year at an event, Sharma had quoted India's dismal ranking in an International Telecommunication Union paper to make the case for a stronger push in rural telephony. The then telecom secretary, J S Deepak, came down strongly on the other side, saying India was a laggard in several sectors. What happened next, I ask my guest. Sharma says the report is public and he has nothing more to add. He says the other two elements of this strategy are using the unused spectrum in television broadcast and allowing private players to send low-earth satellites to create a bigger broadband footprint. All of them will relieve the country of spectrum scarcity, which is driving up prices. He points out that the New Telecom Policy of 2012 had promised an open-sky policy. "It has not got implemented. Antrix Corporation is behaving like STC used to, as a kind of canalising agency. If others can send up these satellites, data costs would crash in India. And there is no security issue involved in their flight." Since he feels this way about spectrum prices, is he then in favour of delaying the auctions of 5G spectrum, I ask. "People (telecom companies), as you say, may not have the ability to bid for it now; we are examining those. The government has asked for our recommendations. A priori , I am not saying it should be done next year but as an individual, who believes in centrality of technology, I believe it should come in fast." There is tremendous scope for its application in agriculture, health or education. And his take on Aadhaar? As we leave, Sharma muses on it. "There was no breach of data security. If someone asks for details of beneficiaries of government programmes in RTI, he will get all the details. This is what has happened in several cases." "You need to see closely why the India stack has made life difficult for tech companies abroad to sense where the questions against Aadhaar are coming from."